As most of you know the Claude & Camille Event for the HF Bloggers Round Table is in full swing! Thanks to everyone who's been following, I hope you are having a great time! In honor of this event I have a another giveaway! As soon as I turned the last page of Claude & Camille I said to myself that I have got to read more by Stephanie Cowell. She's so amazing! 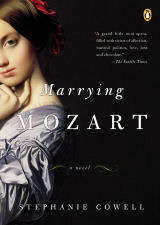 As it happens, I have Marrying Mozart on my shelf and will be reading it as soon as I can. I thought that you, my beautiful readers, would like your chance to win a copy! Giveaway is open INTERNATIONALLY. To enter just leave a comment with your email address. Only one entry per person. Giveaway ends on April 24th. SYNOPSIS: Mannheim, 1777. The four Weber sisters, daughters of a musical family, share a crowded, artistic life in a ramshackle house. Their father scrapes by as a music copyist; their mother keeps a book of prospective suitors hidden in the kitchen. The sisters struggle with these marriage prospects as well as their musical futures-until one evening at their home, when 21-year- old Wolfgang Mozart walks into their lives. No longer a prodigy and struggling to find his own place in the music world, Mozart is enthralled with the Weber sisters: Aloysia’s beauty and talent captivates him; Josefa’s rich voice inspires him; Sophie becomes his confidante; and Constanze comes to play a surprising role in his life. Eighteenth-century Europe comes alive with unforgiving winters and yawning princes; scheming parents and the enduring passions of young talent. Set in Mannheim, Munich, Salzburg and Vienna, Marrying Mozart is the richly textured love story of a remarkable historical figure-and four young women who engaged his passion, his music, and his heart. wow, i've never heard of this, but it sounds amazing! Great giveaway! Would love this one. Thanks for the giveaway!!! This looks so good! I love Mozart! Please enter me. Wow another giveaway open to Canada! Oh, I'd love to win a copy of this book! I would love to have acopy of this one. Thanks for the opportunity! Yes, please, count me in. I can't remember ever reading anything by Stephanie Cowell but from what I have read on the various bloggers sites it sounds like an interesting book. You do amazing giveaways always. Without fail amazing! Please count me in for this. I haven't heard about this one till know but it sounds amazing. Sounds great to read. Thank you for being it international. Please count me in. I have this on my to-read list at the local library. Please enter me into the contest. Thank you! This book has been on my TBR list forever! Great giveaway! Thanks! I would really love to be entered for a copy of this. Thanks for the giveaway. I'd love a chance to win - thanks for the giveaway. This book sounds wonderful. Mozart was such an incredible talent. One wonders how much we lost with his early death. Would love to have a look at his personal life and the women who helped and inspired him. I'd love to read this - Mozart is fascinating. I'd love to win this book! it sounds like a great story. This sounds like another fabulous book! I can't wait to read this! I love historical fiction. BTW...Your blog is as excellent in content as it is eye-catching in design. m (dot) ashton (dot) phillips (at) gmail (dot) com! The story sounds so good, I am an admire of Mozart more for his amazing life than his music at times. The Webers sound fascinating. Email is there when you click my name. Another interesting book! Please count me in. Please enter me! This sounds good! Another wonderful giveaway....please enter me. Thank you! When you finish a book by a particular author and immediately look for another title by the same writer, that's a sure indication of something worth reading. Please enter me in the giveaway. This book sounds really geaat and I'd love to win it. Sounds great! Please enter me for this giveaway! Sounds interesting. Cont me in, please. Thanks!